I just bought a '93 Explorer four door,with a 5 speed,for $350.00. Its main issue is the clutch master cylinder is shot,it has a new slave cylinder. Drove it home from Wells to Elko,about 50 miles,and it drove GREAT! It needs a bunch of little stuff done,door hinges,a gauge replacement,a power window repair etc.but what I want to know is how to convert the full time 4WD to part time with locking hubs. The 4 wheel drive doesn't work-the seller says he tracked it down to the T/C motor,so if I'm going to work on it I'd like to see if there's a way to change it over to a cable shift or better yet an actual linkage and shifter. Any ideas anyone? Is a kit offered somewhere? This may provide some ideas about the 1993 that you bought...Dig a bit deeper...Is this the V-6 engine? I only see a V-6 listing for 1993. If so, this should be the very reliable 4.0L Capri engine. What I'm hearing is that the shift motor is a weak point on this system,though on this truck I think there's an electrical issue. Neither switch on the dash lights up,so today I'll be checking/replacing fuses and looking for a possible relay that might also be faulty. I suppose if I can make it work again I can live with the electric shift set up until Spring. Since the clutch M/C I bought comes without a pushrod or the connection to the pedal I can't do the install until Monday or so,so I've been working on other things it needs,wiper blades,light bulb replacements,adjusting doors,etc. I'll be spending some time reading the repair manual on it and studying the wiring diagrams to figure out what goes where. I'm lucky,my favorite wrecking yard over in Wells has 3 of these,so parts shouldn't be a huge problem. BTW-all the gauges work fine except it hasn't shown any oil pressure;I suspect the wire's off the sender,or the sender's bad. I know replacing the sender on the BroncWorth gave it 15 pounds more oil pressure,'course it was already showing about 20#'s warmed up. This one is completely flatlined,making me think the wire's off or broken. A new development on the clutch issue. The P.O. apparently lost the clutch M/C,pushrod AND the "slave cylinder" he said he replaced is a hydraulic release bearing,so I'm pretty sure he wouldn't have pulled the transmission just to replace a throw-out bearing. it doesn't look to have been tampered with,so I ordered a new one piece sealed and bled clutch hydraulic set up,and a new clutch. Once it arrives I'll pull the transmission out a couple of feet,send the flywheel to be resurfaced and reassemble it with new parts. Also,I expect to have to replace some power window switches and the power mirror switch,since both mirrors adjust but only one direction. A couple of window switches are sketchy too. I might get a can of contact cleaner and see if I can "tune 'em up". On the electric T/C,I checked out the link you posted. Thanks for posting it. I've decided my best bet will be to make the stock set up work again,and spend some time researching other ways to get the set up I want,maybe an earlier pre-electric shift transfer case,like the one in my '84 BroncWorth,could be arranged. What I'm hearing is that the shift motor is a weak point on this system,though on this truck I think there's an electrical issue. Neither switch on the dash lights up,so today I'll be checking/replacing fuses and looking for a possible relay that might also be faulty. I suppose if I can make it work again I can live with the electric shift set up until Spring. Since the clutch M/C I bought comes without a pushrod or the connection to the pedal I can't do the install until Monday or so,so I've been working on other things it needs,wiper blades,light bulb replacements,adjusting doors,etc. I'll be spending some time reading the repair manual on it and studying the wiring diagrams to figure out what goes where. I'm lucky,my favorite wrecking yard over in Wells has 3 of these,so parts shouldn't be a huge problem. BTW-all the gauges work fine except it hasn't shown any oil pressure;I suspect the wire's off the sender,or the sender's bad. I know replacing the sender on the BroncWorth gave it 15 pounds more oil pressure,'course it was already showing about 20#'s warmed up. This one is completely flatlined,making me think the wire's off or broken. The orifice size on many oil pressure senders is too small and tends to clog...Big problem with Jeep 4.2L inline sixes in the late CJ era...Couldn't clean it out, either, a new sender was the only fix...Also check the resistance on the sender circuit, especially the grounding lead. Senders are sensitive to resistance and require accurate grounding resistance. I just acquired a manual shift T/C that,at first glance,looks like it'll work in my Exploder. It was removed from a Ranger around the same age (?) because the owner thought it was the cause of a vibration,but even with another T/C the vibration remained just as bad. It was traced to a bent driveline. I'm not at all familiar with these Ford set-ups,so I don't know how this'll work out. Might need driveline work,and will need a shifter. don't know yet if it'll bolt to my transmission. I notice when I change the hubs to locking hubs there's an "adapter kit" I'll need (for an additional $60.00). What does it consist of,and why is it needed? Used to be the Ford dealer's Parts Man could tell me what fits,what doesn't and what it takes to MAKE it fit anyway,but this kid doesn't know anything about vehicles older than 2000,and THEN,if it isn't in the books it doesn't exist. Anybody out there been through this particular swap? Any knowledge,experience or bits of wisdom will be appreciated. Speed, I would use a Ranger pickup as the model to compare. This includes wiring harnesses and coding. A vehicle at the local recycling yard might be a helpful prototype for comparison. I'd be concerned about any electronic interface issues or feedback sensors that might cause dash light false engine or transmission codes. I'd print out copies of the wiring diagrams for each vehicle and lay them side-by-side. See where the differences and similarities exist. The mechanical concerns like shift controls should be visible in a Ranger example or donor vehicle. Anyone have comments to add? Hands on experience with the Ranger and Explorer would help. Having looked more closely,I discovered the manual T/C and the electronic T/C are both Borg Warner 1350 units but with different shift mechanisms. Everything else appears the same. I'm pretty sure the wiring will even fit both applications,but on the manual T/C the two switches might only serve as indicator lights. Installing the clutch master cylinder,I discover one bolt goes into a VERY hard place to reach,impossible to me. I thought of a way to bolt it in from the INSIDE,by using "clip nuts" which I'll clip over the mounting tabs on the master cylinder,then run the bolts through from the interior. I'm still not clear on the line connection;it includes a roll pin that holds the line into the master cylinder,and a rubber washer,which I'm not sure where it fits. I'll figure it out.THEORETICALLY it'll work fine. I hope to have this one done Friday before dark-I can't wait to do an oil change on it and drive it down and fill the gas tank. Closer to a reliable runner, Speed...Just in time for this cold dip, we're at 20-degrees F this morning at Fernley. How are your late fall temps at Elko? Glad you're wrapping up these vehicle repairs...Gonna be a winter! My '74 Chevy one ton is inoperable-the starter doesn't work. MY opinion is the ignition wire's either disconnected or damaged. The point of mentioning this is that I had an appointment to get to on Monday,but the truck wouldn't start,so I drove the Explorer,still clutchless. Once that was handled I drove over and filled the gas tank and a 1.25 gallon gas can,just for emergency use. Then I took it to a local Garage I trust to get its clutch hooked up and bled. I called this AM,Wednesday,to ask how it was going,and the mechanic said he got it assembled,filled and bled it and it still has no clutch function. I've asked him to work up an estimate to just break it down and do a COMPLETE clutch job,labor only because I have ALL the parts for it new. Hope to hear from him Friday. I don't wanna spend that much on the clutch job,but I need this thing done,and I know I'm unable to do it myself. I think the labor and parts costs are nearly the same,it looks like the labor will probably be around $500-600. I know they can't offer a Warranty if they use owner-supplied parts,but the parts are good quality and the mechanic does excellent work,so I'm not worried. In the meantime,with nothing to drive operable,I'll probably ride the Harley over to my Sister's place foe Thanksgiving dinner. Hope it doesn't snow more than a couple of inches-this bike gets pretty unstable in any more snow than that. Trust you made it safely to your sister's and back. Did you take the Harley? Considerable chill factor these days! Trust you had a pleasant Thanksgiving dinner...Fully understand why you sublet the clutch replacement if it's a hardship due to extreme weather or a shop/tools challenge. Smart move if you like the mechanic and his work. Thanksgiving Dinner was about a 7;the meat was tough and the dressing was good,but not enough. Enjoyed visiting with my Sister though. Yeah,I rode the Harley over-it was raining,but not slick. On the way home,it was SUPPOSED to be snowing hard,but it was clear skies and dry roads. Not sure what the wind chill was-temperature was about 35 degrees,not bad at all. That's been about the high in the last few days,and appears the same will be true for another week,with occasional snow/rain. WONderful! Used the '90 GMC to run an errand,seems to be a sound truck. I need to get the hard water haze off the windshield. A friend told me about something called "Barkeeper's Friend" he says works awesome. I'll write a review when I try it. Finding your way with the rolling stock, Speed! Glad you made Thanksgiving dinner on the bike...safely. After about a Month of work,I got the Explorer back,it STILL isn't fully functional but the mechanic said to drive it a little and see if it works better or worse,bring it back in a week or so and we could go from there. It got worse-well,it stays the same some of the time,is worse some of the time,I'm taking it back tomorrow to see if he can take another run at tilting the truck's nose up high on the hoist (to encourage the air to go to the lines so a pressure bleed might get the air out.) That got a lot of air out of the system with the pressure bleeder last time. 🤔I think there's some value to using vibration to jar the air bubbles loose from wherever they're hiding. He DIDN'T do that last time. Dutch suggested using an electric engraver with the point flattened and going all over the lines and M/C to make all the bubbles go to the highest point THEN bleeding it. ONE thing is obvious-this truck is WORTHLESS on any kind of snow,ice or mud without the 4WD working😠. (Only 1 wheel driving and no appreciable tread on it,and a clutch that drags enough to keep pushing the truck except on dry pavement.) I got in contact with the guy who owns the truck ( Bronco II) the manual shift T/C is from,he gave the truck to a friend but the friend says the shifter is still there and I can have it,so that's one less thing I need to find. Apparently the linkage is missing,but I can make that;the part I can't make is the little arm the linkage connects to that fits the stub shaft sticking out of the T/C case. I figure I could probably get by with the stock automatic hubs until I find a set of manual hubs. Not the best choice for mileage,but will work if needed. Holiday Best, Speed...We're nearing New Year's Eve with the temps dipping as expected this time of year, Elko especially. For hydraulic brake and clutch systems, I prefer vacuum bleeding from the wheel cylinder, caliper or slave end. This is not possible on clutch slave cylinders like the Jeep Wranglers that have no bleeder valve and use a fixed line at the slave. One method that has worked for me is bleeding the clutch at the clutch line/fitting where it attaches to the clutch master cylinder. Crack that fitting just enough for air and a slight amount of fluid to escape with pressure applied at the pedal. Wedge the pedal at the applied position for a while. Air should escape as bubbles compress. Sometimes, it's only necessary to apply pressure and hold this pressure for a while without loosening the fitting. Air will rise to the master cylinder as you hint. Look over the '93 Ford truck details. Which style clutch slave do you have on the Explorer? What method will work? The Exploder-I mean Explorer,has a hydraulic release bearing,with two stub lines coming out of the bell housing and a bleeder also outside the bell housing. As near as I can tell,the lines at the bell housing use quick couplings that keep everything sealed up until they're connected. I have some shop time booked Monday to get this thing finished. I decided the next project is a front axle rebuild on the Toyota. It's had one axle that's been a little noisy for some time,but it worked fine at 45 mph or under,but last time I locked the hubs it shook like hell even at 15 mph. I noticed it got even worse when I made a right turn. I have a couple of good axles I bought from a guy last Summer when he changed his rock crawler over to the Chevy style axles. I figure this is the time to swap the good axles in and re-seal the pinion and steering knuckles,and convert to Synthetic lube. Maybe drain and re-fill the REAR axle with Synthetic too. I wanted to go for a couple of Yukon pocket-lockers too,but their price has gone beyond ridiculous. One painful step at a time,right? STILL waiting for the Exploder to be finished. They finally got the hydraulics working but it still isn't disengaging fully. I don't know about quality,but I'll be getting my switches from LMC. It seems like everyone has problems with the window switches. It'd be worth sourcing the best of 'em and offering a conversion harness and switch to fit whatever vehicle you own. Sounds like the mechanic had plans to bleed the clutch again but he says he'll go ahead and change out the clutch first. He's convinced that quick release coupling at the release bearing will allow air into the system so he'll have to bleed the system again anyway. Something that crossed my mind is this;When I got this truck there were supposed to be two nuts welded to the inside of the firewall that were to bolt the master cylinder in-the bolts were to be inserted from under the hood,and the one closest to the transmission was a genuine pain to get to-the brake booster hung right over it and my arm had to bend backwards to start it. the other hole was useless,the nut had broken loose,so the hole it left was almost the size of a dime. I went ahead and broke the other nut off the firewall,and put a modified "clip nut" on each ear of the master cylinder,and using bolts with medium sized flat washers,I was able to bolt the master cylinder in from INSIDE the truck-MUCH easier. Here's the question-the clip part of the clip nuts is,I'm guessing maybe ..020-.040" thick,and that's what is between the cylinder and firewall-would that stand the master cylinder far enough from the firewall to affect the clutch travel? I doubt .040 is enough to make a difference,but then,I didn't think a BB sized air bubble would keep the clutch from working either. Popular opinion in the shop is that the PO installed something wrong or something he installed is defective. (release bearing-is it supposed to have a spacer or something behind it to push it forward from the transmission a set distance??) Seems like there was a hard plastic "sleeve" about a half inch or so thick that kept the release bearing from bottoming against the front of the transmission,but this might have been a different application.Looking at the Manual I see there IS a bolted in "alignment collar" of sorts,and a spring behind the release bearing;I think forgetting either one could cause a failure to release. Nothing is as easy as it seems. I got a call from the shop manager asking me to come to the shop. When I got there I expected the truck to be apart waiting on installation of its new clutch but NOTHING was done. Turns out the rear spring hangers and shackles are rusted through,and the mechanic said he wouldn't do the clutch until I got these parts replaced. (It ALSO needs front wheel bearings and lower ball joints.) I have the parts located,it'll be a little spendy but it fixes everything I need to start driving the Exploder. Then,all that's left is little stuff-a door,some power window switches,a heater fan switch,a shifter for the manual shifted Transfer case I'll be installing when Spring comes and a set of locking hubs. Grand total will be under $2,000.00 for something I've wanted for a long time. "...Here's the question-the clip part of the clip nuts is, I'm guessing, maybe 020-.040" thick, and that's what is between the cylinder and firewall-would that stand the master cylinder far enough from the firewall to affect the clutch travel? I doubt .040 is enough to make a difference,but then,I didn't think a BB sized air bubble would keep the clutch from working either. Popular opinion in the shop is that the PO installed something wrong or something he installed is defective. (release bearing-is it supposed to have a spacer or something behind it to push it forward from the transmission a set distance??)" This is a good question, Speed. 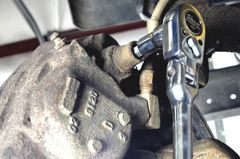 You need enough clutch master cylinder piston stroke and pedal travel to displace enough fluid to release the clutch. The clutch slave/release bearing must travel far enough to move the clutch cover pressure plate away from the clutch disk. If your pedal hits the floor too soon, without displacing enough fluid, the clutch fingers will not go far enough to release the clutch. Your concern here would be pedal travel. Do you need the pedal to travel further? If so, a longer pedal pushrod would help, and that would raise the pedal further from the floorboard. In any case, when the pedal is fully released, there should be a slight gap between the pedal pushrod and the clutch master cylinder piston. This enables the clutch master cylinder's piston to fully retract, which enables the clutch master cylinder to displace enough fluid when the clutch pedal moves the pushrod over its full range of travel. Another overlooked possibility is a clutch master cylinder piston seal that simply does not hold fluid and pressure properly. Fluid could be seeping past the piston seal and not moving through the hydraulic line into the clutch hydraulic release bearing. This happens with brake master cylinders as well. Well,the clutch problem is SOLVED! And I didn't have to do ANYTHING to make it work! I took it to Les Schwabb to get some decent tires on it;they did the swap and PUSHED it out of the service bay,leaving it parked just outside the door. I'd explained the clutch would "work" if started in gear but would drag when stopped,like an automatic would. Apparently that scared 'em. Anyway,I got in the truck to leave,and as I did,my toe got under the clutch pedal and pulled it up a little. Something popped,and after that the clutch worked perfectly. My theory is that the pushrod from the pedal wasn't seating properly,and wasn't letting the master cylinder operate all the way through its range,and lifting the pedal allowed it to "center" itself. A closer inspection shows only ONE lower ball joint is bad,and it's DESPERATELY in need of a bearing pack. The NEW plan is to junkyard a set of stock locking hubs and spindle nuts/springs/etc. and installing those as I do the wheel bearings. Dutch says if I can make it to his place he'll help me do the lower ball joint (s) and get it aligned. I have some parts-N-tools to bring him anyway. THAT brings me to my next concern. My mileage has been hovering around 10 mpg,and I KNOW it can do better than THAT. This truck has two NEW O2 sensors,but the plugs they should plug into are missing. I know what the color codes are,one is a 3 wire,the other is 4 wires,of which two wires are paired to the 3 wire one,and the wires go from there-not sure where. I believe the PO butchered the wiring harness to 'em by pinching 'em between the block and bell housing when he installed the clutch and either cut 'em off or tied 'em off somewhere. I've noticed this thing starts GREAT in cold weather,and runs GREAT,but its behavior,and the fact that even with a leaky crossover pipe it NEVER backfires on compression braking,tells me it's running rich. The "check engine" light goes on and off randomly;I'm pretty sure the O2 sensors are most of the problem,but I'm nervous about doing anything with the wiring-I don't wanna risk smoking the ECM,even though there's half a dozen of these at Garcia's Towing in Wells. I ALSO need to go to school on adjusting the headlights on this thing-this is the first ever "modular headlight " set up I've ever owned. I have to find a 3mm socket too. I gave it a set of 100W headlight bulbs,so I should have a LOT more range than I'm noticing. I have my "Gotta Do" lists done for each vehicle now,and I have most of the parts,excepting a clutch and ring gear for the BroncWorth and some sort of an A/C compressor bracket for the '54 GMC. Found a shop that "specializes" in rusted exhaust bolts;their shop looks a mess but they have a good rep for doing good reliable work,so I'm getting an estimate to fix the exhaust leaks and do a wheel bearing pack,installing the locking hubs I'll be bringing in. (I have new Timken bearings and National grease seals to use-they're fine with using the parts I bring in,as long as they're not used or "no-name" junk.) I have a brake hose to replace on the right front,but I can do that myself. I also bought some synthetic ATF to use in the T/C when I install the manual shift unit. Still need a couple of pieces of linkage for that-the tab and retaining nut and washer on the T/C,the shift link to the shifter and the shouldered bolt the shifter pivots on. I could make these parts,but I'd need a transmission to attach everything to,to mock it all up and test its operation on the bench.The way I see it,I'm getting close to having the machine I've wanted for quite a while,comfortable,roomy,reliable,set up the way I LIKE it,runs down the 4 lane at 90+ all day long,with decent mileage thrown in while still capable of bashing around the hills-all for under 2 grand. Down the road I might throw a little more into it for a locking rear end,a receiver hitch,maybe a beefier front bumper with a winch,but that's really about all I could want. I have PLENTY of OTHER trucks for other purposes. It must look like I'm lazy,but this last year has wrought havoc with my health,and I've discovered there's a LOT of work I just can't do anymore. The shop who did the exhaust and wheel bearings gave me a quote to replace the lower ball joints,but the owner said,"Huh-THIS is weird. For only another 3/10ths of an hour flat rate you can get ALL FOUR done." That'll make it around $360.00 plus my cost for parts. Not sure if he's set up to align it but that's not bad. As far as "farmed out" work,that'll be about all I need. The rest of it is just little stuff I can do myself. OH-that reminds me,I was given a '93 Exploder parts car. No title,but it's complete and is a runner. Has an auto. tx and full time 4X4. The guy says he thinks it has a posi rear end too. If that's true,I HOPE it's a 3.73 ratio. That'll also give me a couple of doors and the LF hinges,the inside liftgate cover,and a receiver hitch,and MAYBE even a set of hubcaps. I'm going out to check it out Sunday and do an "inventory" of what I can use. Things are looking up there, Speed! The mileage is impressive, and that's the end game with an Explorer...Good progress!